Q. Define Communication. Describe Communication Process and communication channels used in organisation ? Communication begins when one person sends a message to another with the intent of evoking a response. Effective communication occurs when the receiver interprets the message exactly as the sender intended. Effective communication is essential for the functioning of any organization. Managers need to transmit orders and policies, build cooperation and team spirit, and identify problems and their solutions. Employees need to clarify directives, provide feedback, and make their problems known. Team members need to share feelings and perceptions to solve problems and resolve conflicts. Communication breakdowns contribute to a host of organizational problems, from failure to carry out simple directives properly to low productivity and quality. Communication in organizations serves three major purposes. It allows members to coordinate actions, share information, and satisfy social needs. The main components communication are the sender, the receiver, the message and the channel. The communication process includes the sequential steps of Encoding, Transmission and Decoding. 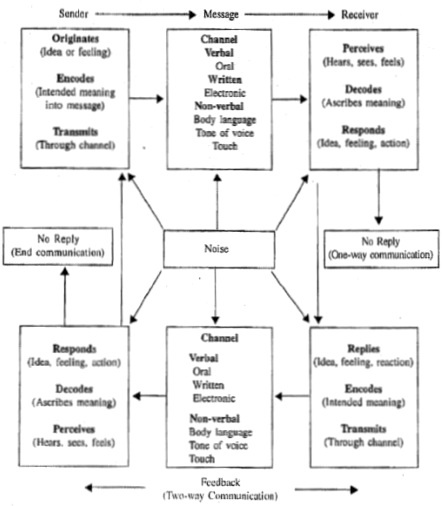 Encoding: The sender desires to communicate to the receiver some idea, feeling, or intention. Encoding is translating the information into a format that will get the idea across. The result is the message, which now is ready for transmission to one or more of the receiver's senses through speaking writing, gesturing, or touching. Transmission Channels: The channel is the medium through which the message is transmitted. Oral/verbal communication takes place in speeches, meetings, phone calls, or informal discussions. Nonverbal communication is the communication without words. They take place through touch, tone of voice, facial expression or gestures. They can carry meanings that mere words are not capable of communicating. On-line technology can improve communication efficiency and result in better productivity. But, minimizing face-to-face contact and opportunities for soliciting feedback can lead to misunderstandings and lack of nonverbal support, which are often the keys to effective communication and motivation. Decoding: Communication does not take place if the receiver's senses fail to perceive the sender's message. Decoding is the receiver function of perceiving communication stimuli and interpreting their meaning. It encompasses both comprehending the content of the message and determining the sender's intention in transmitting it. The closer the receiver's decoding to the sender's intended message, the more effective the communication has been. After the message has been decoded into information meaningful to the receiver, how the receiver feels about and responds to the message will depend on the receiver's needs. No matter how clearly information has been encoded, misunderstanding is always possible in its decoding because this process is influenced by the receiver's past experience, personal interpretations, and expectations. Noise: Noise is anything that interferes, at any stage, with the communication process. The success of the communications process depends to a large degree on over-coming various sources of noise. After the sender, or source, has encoded and transmitted the message and the receiver has received and decoded it, the feelings, ideas, and intentions generated in the receiver are usually communicated back to the sender. In this reversal, the receiver now becomes the responder and the original sender becomes the receiver, and the process continues. An important component of the second stage of the communications process is feedback. Feedback is the message that tells the original sender how clearly his or her message was understood and what effect it has had on the receiver. Feedback is the manager's primary tool for determining whether or not instructions have been understood and accepted. It can be transmitted through a variety of formal and informal organizational communication channels. How are Communication Channels Used in Organizations? Communication between organizational members can be vertical or lateral, formal or informal. Formal communication channels are established within the organization's chain of command in order to accomplish task objectives. Downward Communication: Downward communication is used by managers to assign goals; provide job instructions; inform about policies, procedures, and practices ; provide performance feedback; point out problems. Downward communication can take many forms; speeches, memos, company newsletters, bulletin boards and policy and procedure manuals. Upward Communication: Upward communication provides managers with information about current problems, updates on employees' progress toward goals, suggestions for improvement, proposals for innovations, employee grievances, and feedback about employee attitudes. Upward communication can take the forms of employee surveys, suggestion boxes, face-to-face encounters, open-door policies, or required reports. Horizontal Communication: Horizontal communication takes place among peers and can cut across departments and work groups. These lateral communications benefit the organization by more efficiently providing support, coordination, and information than could vertical channels. Some organizations form task forces and committees to facilitate information exchange and coordination between departments. Informal communication channels exist to serve the interests of those people who make them up, regardless of their positions in the organization. They are not formally sanctioned by management and do not follow the organization's hierarchy; however, informal communications are often perceived by employees as more believable than communications received through formal organizational channels. Some typical informal channels are the grapevine, social gatherings, informal one-to-one discussions, and small-group networks. The Grapevine: The grapevine is the informal communication channel for gossip and rumours and is not controlled by management. The grapevine satisfies social needs, helps clarify orders and decisions, and serves as a way of getting out information that can't be expressed adequately through formal channels. Pattern and direction of communication flows have important consequences for both task accomplishment and personal satisfaction. The chain network typifies the organization with a strong. vertical hierarchy, where information travels only upward and downward. People communicate only with their immediate superior and subordinate. It also exists between people working on a production line. In the circle network, people can only communicate to others on either side. This pattern often occurs between people in departments at the same horizontal level in organizations. The star configuration distributes the flow of communication most evenly. It prevails in informal groups with no assigned leader or tasks to accomplish. The wheel represents the other extreme, where all communications are channelled through a central position. The effectiveness of the communication networks varies according to the task. The centralised wheel-type formation provides more efficient and accurate problem solving of simple and routine tasks. For ambiguous and complex problems, however, the more egalitarian star network is much more effective. Overall group satisfaction is greater in the more egalitarian star networks because group members participate more evenly. In centralized wheel networks, individuals holding the central position are much more active, satisfied, and likely to become leaders than those in peripheral locations. It's best to take part in a contest for one of the best blogs on the web. I'll recommend this site! approximately all significant infos. I'd like to peer extra posts like this . I'm shocked why this twist of fate didn't happened earlier! it may not be a taboo subject but usually people don't discuss these topics. To the next! Best wishes!! so i came to “return the favor”.I'm trying to find things to enhance my site!I suppose its ok to use a few of your ideas!! delicious. And obviously, thank you on your effort! of your site is wonderful, as well as the content material! A lot of times it's tough to get that "perfect balance" between superb usability and visual appearance. I must say you've done a amazing job with this. suppose you added a little information? I am not suggesting your content is not good. picture or two to grab readers excited about everything've got to say. In my opinion, it might bring your website a little bit more interesting. Hi to every body, it's my first go to see of this website; this web site consists of amazing and in fact excellent material designed for readers. It iѕ trulу а nice and helрful ρiece of informаtiοn. this helpful info wіth us. Pleаse staу us informed like thiѕ.